We have six hummingbirds at the feeder now. 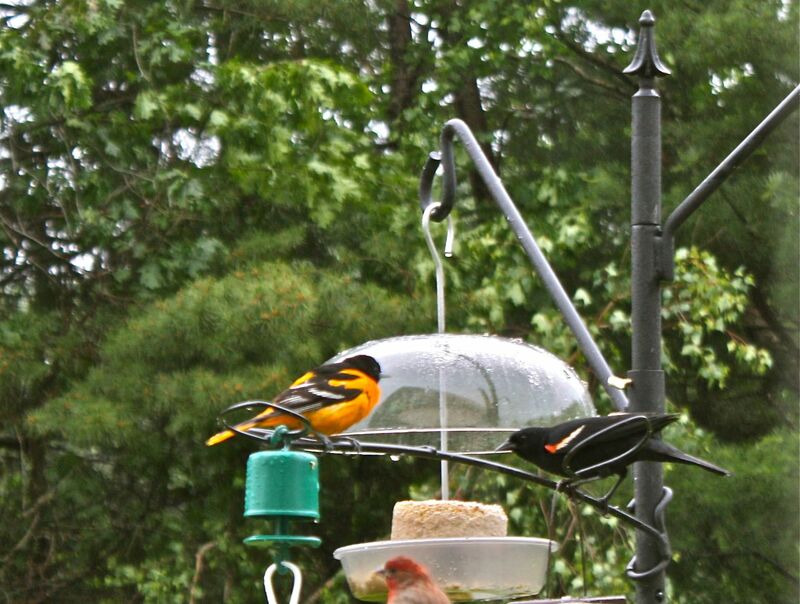 They eat a lot less than the dozens of hummers at my Virginia feeders so only one feeder is needed. 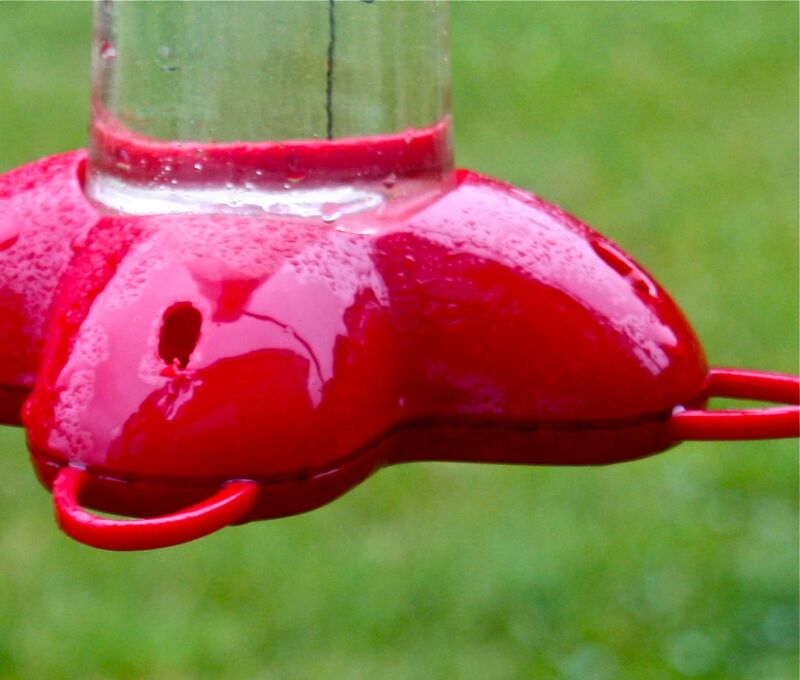 All hummingbird feeders have small bee guards on the openings to prevent insects from crawling into the nectar. A few mornings ago I noticed two of the bee guards were missing. The next morning, another of the guards was gone. The birds were left with three gaping holes from which to feed and one bee guard. This is an obvious sabotage from some creature. But who or what could do this? Hmmm….. The number one suspect is the squirrel. He’d been caught with his hands in the cookie jar many times. All was well for a day until I noticed the fourth bee guard missing. Jeepers! 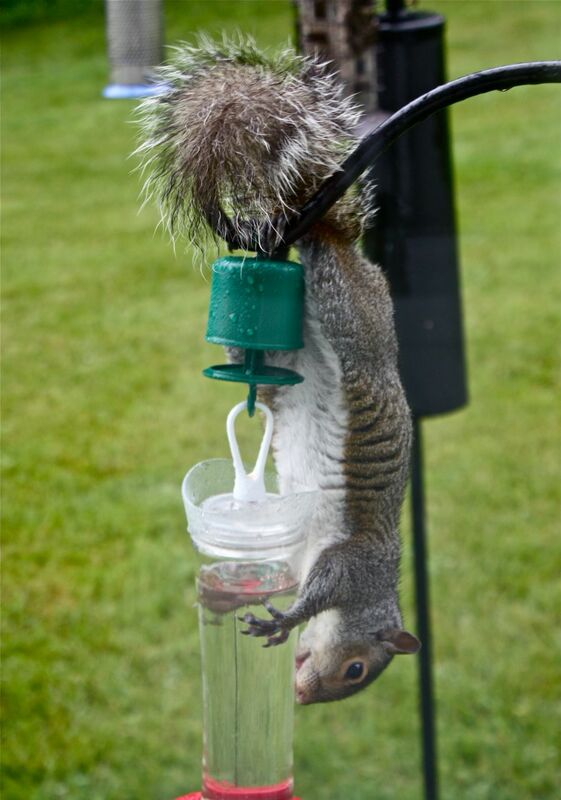 It wasn’t the squirrel after all! I quickly bought a second hummingbird feeder and organized a round-the-clock stakeout with camera in hand for the other. The hummers migrated to the new feeder and I watched the old feeder. It didn’t take long before the culprit appeared. Click…click…click….click. 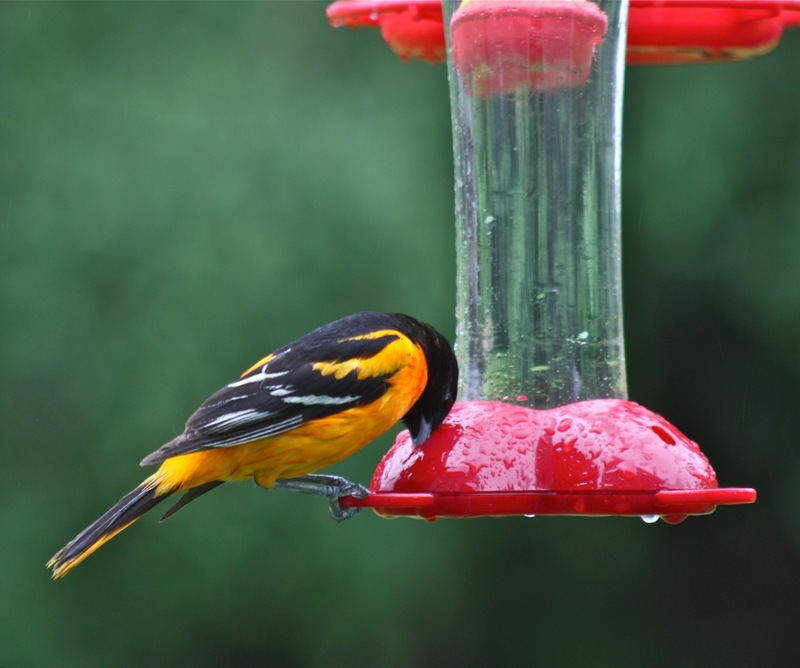 A beautiful Baltimore Oriole (Icterus galbula) has claimed this nectar as his own. He’s the one who pulled off the bee guards, quite common I read, and he drains a feeder in a day and a half. We are delighted. 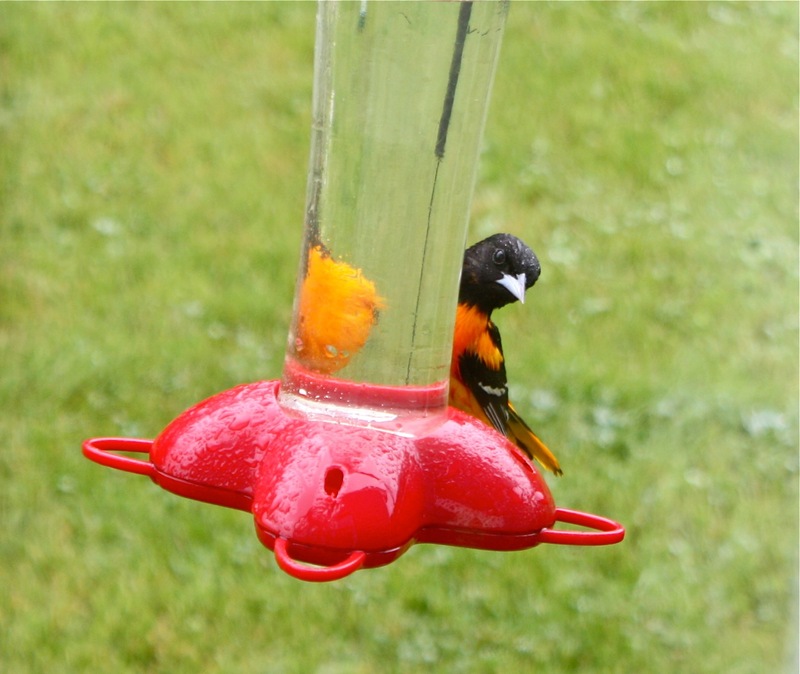 Oranges and a new oriole feeder go up today. 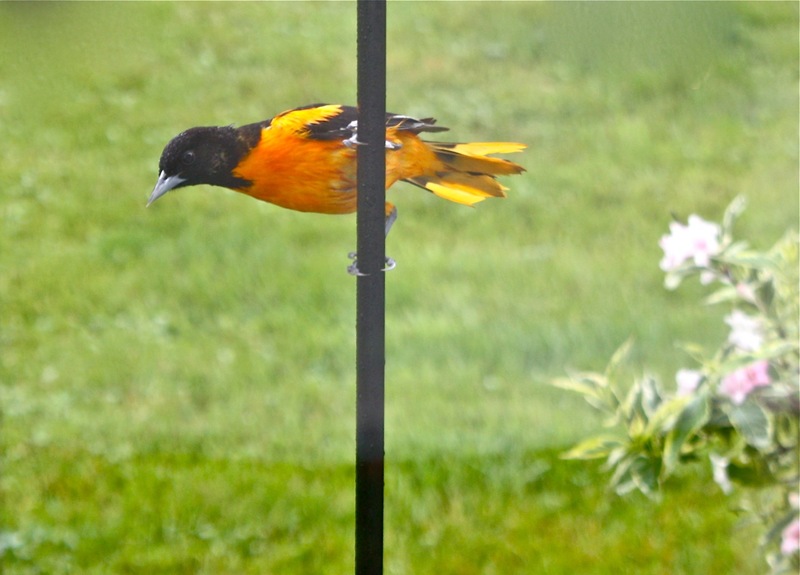 We believe Mister Oriole arrived on June 1, ahead of female orioles, to stake out the best territory for his lady. We are waiting and watching for her. 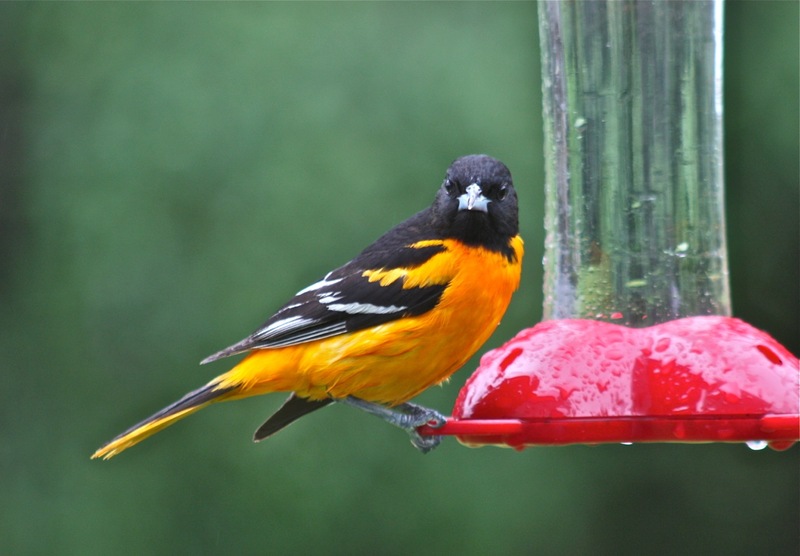 The Icterids are a group of birds, mostly black, often with splashes of yellow, orange or red. This group includes the bobalink, meadowlawks, and red-wing blackbirds that we see breeding and nesting across the meadow surrounding this property. Matter of fact, we have seen these two ‘cousins’ coming face to face atop the feeding station, each going to different feeders. Birdwatching sure is fun and full of surprises! This entry was posted in birding, birds, Horticulture, New Hampshire and tagged Baltimore Oriole, Bird, birding, birds, Hummingbird, Icterid, Mother Nature, nature, Nectar, Squirrel by Annie. Bookmark the permalink. What a happy surprise. These are such colorful birds, and you’re lucky to be enjoying them along with your bright hummers and bluebirds! Birding in New England in the summer is amazing! Today I had a rose breasted grosbeak on the feeder eating Birdberry Jelly. That’s a first. It is so much fun bird watching through the eye of your camera. Thanks so much. But it’s exciting to be up close and personal to these feathered friends. What a fun story. You do have so many nice birds and I like the squirrel too. You like the squirrel? As long as they aren’t on the feeders or bring us fleas, they can stay. 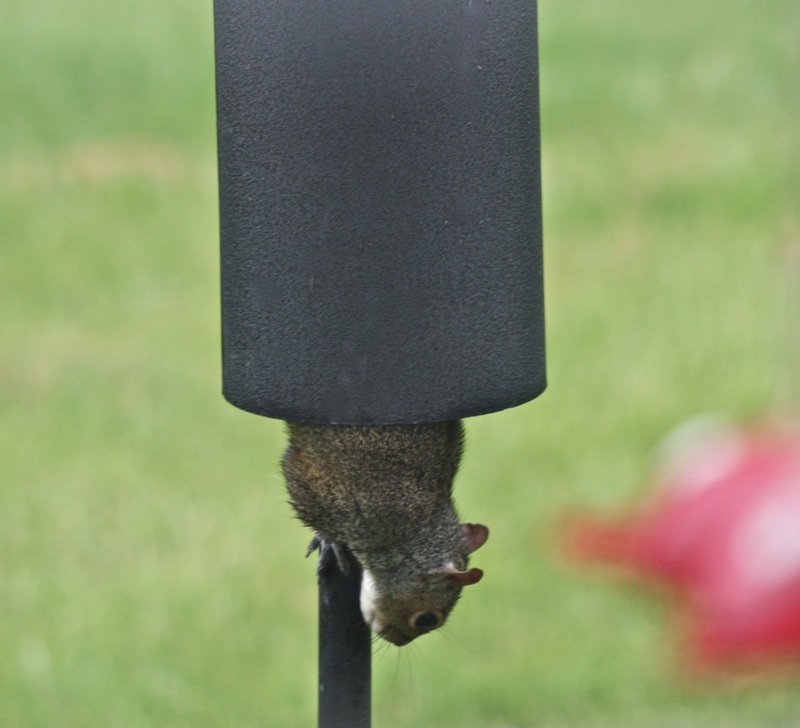 Brilliant photos and squirrel baffler! Stunning bird! What a fun Northern find! 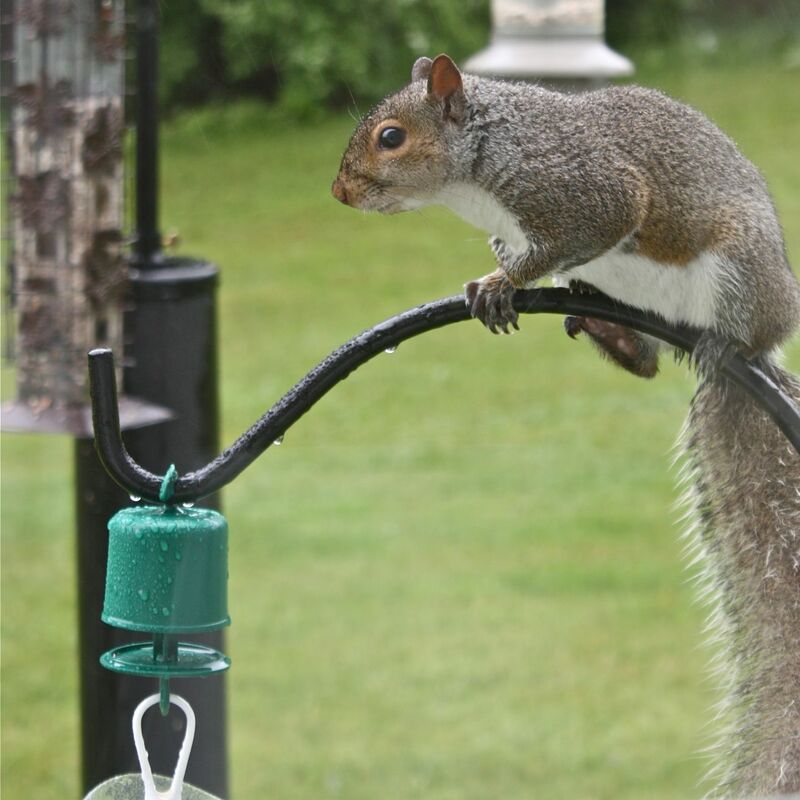 We’ve added Birdberry Jelly from Wild Birds Unlimited to the feeder. Not only are the orioles hooked, I’ve seen a female Rose Breasted Grosbeak sampling the jelly. Neat.